St. Benedict of Nurcia is one of the BIG ones! Today is the saint’s feast day (July 11). He holds the title: father of western monasticism, and is also one of the patron saints of Europe.He was a person who desired peace and was a guiding light to civilization. The man, the saint, and the legacy are worth knowing and re-telling. Benedict lived in the late fifth and early sixth centuries. He was a fraternal twin, and his sister Scholastica also became a great saint. The time period of the saints’ lives was an era of political transition, corruption, and unease. The western Roman Empire had fallen and civilization with it. People did not know who the good people or the evil people were and this led to moral ambiguity. Chaos, confusion and anxiety were the fallen spirits of the day. In such a state of affairs, ambition and pride were greatly rewarded. Benedict lived in this arena. He was the son of a nobleman, received a Roman education, and had all the means available to him to live a comfortable and easy life. The world was at his fingertips. Yet, in seeing the world around him, Benedict wanted none of it. He wanted peace. The saint’s reputation for holiness quickly spread and others asked that he lead them. He took this responsibility seriously and called for discipline in community and prayer. The early monks quickly rebelled and tried to poison him. In blessing the cup with the poison, it shattered and Benedict saw their intentions. After leading several communities in the Subiaco area, Benedict eventually travelled to southern Italy and established Monte Cassino, which would become the mother monastery of the Order of St. Benedict. Civilization was in a twilight. Monasticism developed in the East and was known for its extremity and peculiarity. In wanting to provide a means for peace through ordered community and prayer, Benedict exhorted moderation to monastic discipline. The great saint prayed, fasted, and then wrote his famous Rule. The Rule became a guide not only to monasteries but to Western civilization itself. Comprised of 73 chapters, the Rule addresses spiritual and administrative aspects of monastic life, and could best be summarized by the maxim, Ora et Labora. The Rule balances prayer with work and vice versa. It tempers the severity of penance with charity, and develops the concept of authority and the role of the “abbot,” or father of the community. The Rule quickly became a “handbook of civilization” and a guide to those who wanted reason over passion, order over chaos, light over darkness. 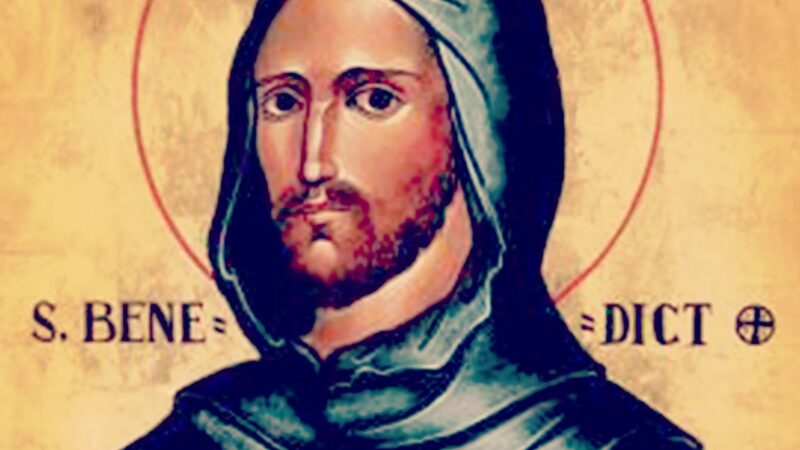 Benedict’s life, his choices that led him to pursue the peace that only God can give, has come to be known as the “Benedict Option.” In a world of uncertainty and moral decay, the Option of St. Benedict is to seek an ordered community and a strong life of prayer. By intentionally seeking this Option, a person becomes a part of a small oasis of civilization, which becomes a beacon of hope and a refuge for all who have been hurt or rejected by the world. In choosing the Benedict Option, the early monasteries would become the first hospitals, orphanages, schools, markets for trade, social outreach centers, courts of justice for all, hotel systems, etc. They became instruments of the Lord’s peace in a world that forgot itself, abandoned moral right and wrong, became intoxicated on power and greed, indulged in its passions, and lost its way. The Benedict Option saved civilization and it can do it again. As we honor this great saint and champion of peace and prayer, we are also invited in the midst of our world’s intoxication and confusion, to choose the Benedict Option. We can choose to be people of prayer and to involve ourselves more in the work of the Church, in our parish and in the Church’s outreach. By following the ordered community life and our spiritual lives in accord with the Benedict Option, we can also be instruments of healing, hope, and of the Lord’s peace in our world today.